The Coast Guard Research, Development, Test, and Evaluation Program, in partnership with the Department of Homeland Security Science and Technology Directorate, launched two 6U CubeSats from Vandenberg Air Force Base, California, as part of the Polar Scout project. Photo courtesy of SpaceX. The following is a release from the Acquisitions Directorate. 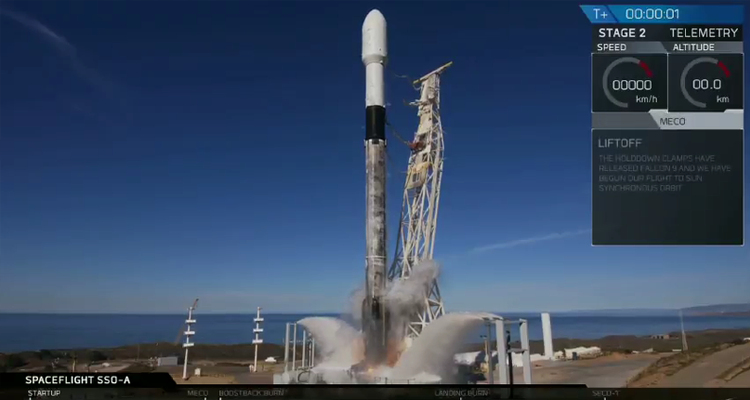 Coast Guard Research, Development, Test, and Evaluation (RDT&E) Program, in partnership with the Department of Homeland Security (DHS) Science and Technology Directorate (S&T), today launched two 6U CubeSats from Vandenberg Air Force Base, California. The launch is part of the Polar Scout project to evaluate the effectiveness of space-based sensors in support of Arctic search and rescue missions. Knowledge gained from this demonstration will be used to inform satellite technology recommendations for many potential applications within the Coast Guard and across DHS. The CubeSats, dubbed Yukon and Kodiak, were launched into a low-earth polar orbit on a rideshare with other spacecraft from 17 different countries. This economical alternative to a costly single-mission launch ensured dozens of spacecraft from various organizations reached orbit. Success of the mission was due to public and private sector collaboration throughout the process, from developing the CubeSats to propelling them into space. “In order to demonstrate, test and evaluate the viability and utility of CubeSats for Coast Guard missions, the Coast Guard RDT&E Program has partnered with DHS S&T to conduct on-orbit testing of CubeSats using the Mobile CubeSat Command and Control (MC3) ground network,” said Holly Wendelin, command, control, communications, computers, intelligence, surveillance and reconnaissance domain lead. Developed as a potential capability bridge between the current 20-year-old international search-and-rescue architecture and its future successor, “CubeSats serve as a much smaller, more cost-efficient solution that can be easily implemented over a short period of time. Each are only about the size of a shoebox,” said John McEntee, director of Border Immigration and Maritime at S&T. In the 18 months leading up to the launch, DHS S&T handled the fabrication of Yukon and Kodiak, which are tailored specifically to detect 406 MHz emergency distress beacons. At the same time, the Coast Guard Research and Development Center (RDC) deployed two ground stations – one at the Coast Guard Academy in New London, Connecticut, and one at University of Alaska Fairbanks – using the MC3 architecture and network. The ground stations will receive all of the signals from the CubeSats during the demonstration. DHS will begin testing and demonstrations using emergency distress beacons in the Arctic beginning in early 2019 and continuing through the summer. “The demonstrations will include downlinking 406 MHz emergency distress beacon data from the CubeSats using the deployed MC3 ground stations,” Wendelin said. “We will set the beacons off, the satellite should detect it and send signals back to the ground station.” The testing period is expected to provide critical knowledge on how CubeSat technology can be used to enhance Coast Guard and DHS mission performance. The Polar Scout project is providing valuable insight on the process, cost and feasibility of acquiring and using organic satellites. The Coast Guard and DHS will use the knowledge gained from Polar Scout and the MC3 installs, market research and space mission design and assessments to develop satellite technology recommendations. As Coast Guard missions become more challenging and complex, the use of small and inexpensive satellites has the potential for great impact. Potential uses for satellites include improving communication in the arctic environment, monitoring large areas for illegal activity and helping to locate persons lost at sea. Additionally, the use of satellites has the potential to reduce the time and resources spent on intensive aircraft searches as well as the risks associated with placing personnel in hazardous situations that only need sensors and communications on scene. “Undoubtedly, the results and knowledge gained by the Polar Scout Satellite Project will lead to force-multiplying solutions for the Department, which is a big priority in this age of complex threat cycles,” said Bill Bryan, senior official performing the duties of undersecretary for the Science and Technology Directorate. Through Polar Scout’s robust search-and-rescue satellite solution, the Coast Guard may be empowered to respond to maritime disasters with unprecedented speed, preserving lives and even cargo, along trade routes in the Arctic Circle.